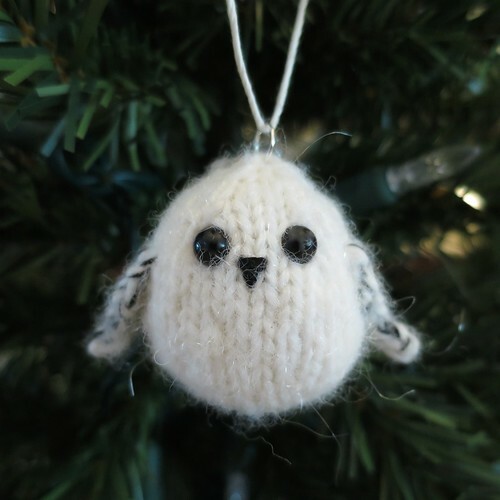 This week we are knitting up a little snowy owl ornament. 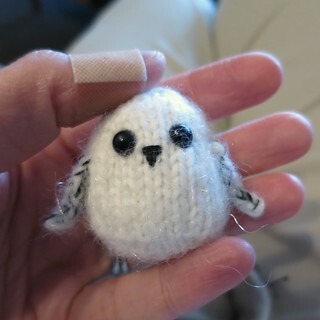 This little guy is based on our much bigger Little Black Owl, but only two inches tall. 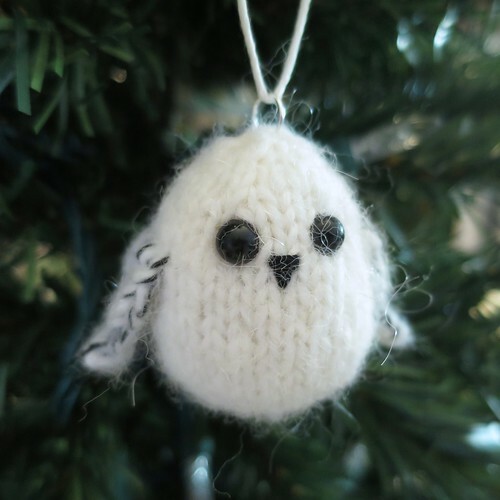 I thought a white, snowy owl was perfect for a Christmas tree (and great for any Harry Potter fans too). 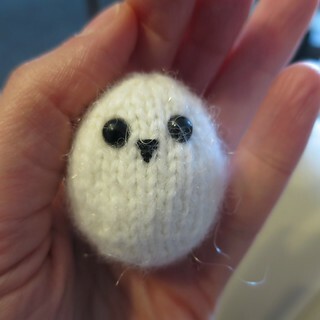 Because snowy owls often have black feathers mixed in with the white, especially on the wings, I knit some black embroidery floss in with the yarn on the wings. This is a super quick knit, but it is a little fiddly since you start out by knitting with only six inches in the round. It gets better quickly with increases. Download a pdf of the Snowy Owl Ornament Pattern (For ease of printing this pattern does not contain the tutorial pictures. Cast on 6 stitches. 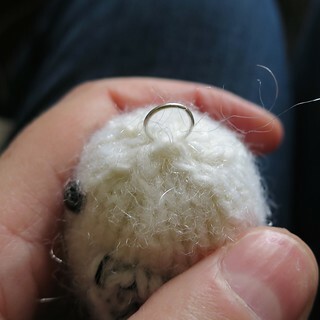 Join together to knit in the round placing a stitch marker between the first and last stitch to mark rows. Add extra stuffing if needed. Cut the yarn leaving about a 12-inch tail. Put the tail on a tapestry needle and weave through the stitches remaining on the needles. Pull tight to close the hole. Pull the tail through the top to the bottom of the owl and weave in the bottom (this will help round out the top rather than having it pointed). I prefer to knit the wings separately and then sew them on, but you can also pick up stitches and knit them right on. Cut a piece of embroidery floss about 2 – 1 ½ feet long. Divide the embroidery thread in half so you are working with three strands for each wing. Knit the embroidery thread and yarn held together. Cut the yarn leaving about a 6-inch tail and weave into the last stitch. Use the cast on tails to sew the wings into place. Weave the tail at the tip of the wing halfway up the back of the wing and then use it to pull the wing to the side of the body. Open the jump ring and put it through a stitch or two on the top of the owls head. You want the ring to face the side of the owl. Close the jump ring. Use a piece of ribbon or ornament hook attached to the jump ring to hang. Please do not duplicate for distribution, repost, sell or teach without permission. 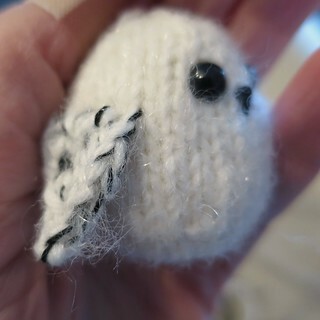 5 years ago by Kat in Advent Calendar Project , Christmas , Holiday , Knitting , Knitting Projects , Needlecraft , Projects | You can follow any responses to this entry through the RSS feed. You can leave a response, or trackback from your own site. Thank you. Adorable tiny bird! I absolutely adore this pattern! (I’m a huge fan of owls.) I included a link to this pattern in a blog post a few years ago. I’d like to update it with photos and wanted to know if I could use one of these? I’d credit whomever you’d like me to, of course. Thanks so much! lovely, but a nightmare to knit with boucle! he looks super fluffy though.